A project update on the stops for HLRT, and Gateway terminus design. To view a full copy of the staff report, see here. Daytime meetings are challenging for participation. But, Fight Gridlock will be represented by me, Kevin Montgomery. 9.2.1. Report from C. Duyvestyn, Director, Transportation Special Projects, Public Works and Engineering, dated December 19, 2016, re: Budget Amendment and Request to Begin Procurement – Purchasing By-law Section 4.0 – Light Rail Transit Extension (Alternative Routes) Environmental Assessment Study from Gateway Terminal to Brampton GO Station – Wards 1, 3 and 4 (File IA.A [16-3130-101]). 9.2.2. Report from C. Duyvestyn, Director, Transportation Special Projects, Public Works and Engineering, dated January 13, 2017, re: Hurontario Light Rail Transit Project Update – Stops – Wards 3 and 4 (File IA.A [16-3130-481]). This report will request that Council allow $4.4 million to begin procurement for the EA of 2 alternate routes: Kennedy and McLaughlin. Further proposed is that a new staff position be created to oversee the EA study. Recall that the original HMLRT EA Study took 7 years to complete. This will be much the same. After discussing this situation and hearing from residents, Fight Gridlock’s position is that it’s too rash to jump to an LRT solution on these alternate routes. Recall that the existing Züm ridership of Main St. was considered in the merits of LRT on Main St. There was much debate on the value of LRT on Main St. based on ridership numbers. While there are existing bus routes on McLaughlin and Kennedy, neither have Züm service. For reference: McLaughlin operates on about a 15 minute cycle during rush hour. Kennedy is about 7-10, which is better. But Main has a 5-10 frequency, with articulated buses for more capacity — which is often met. Fight Gridlock will propose a revision of terms for the EA to pilot Züm first on alternative routes. This will allow accrual of ridership data, and allow transit users to show their preference of routes to the Downtown Terminal. Another co-founder of Fight Gridlock in Brampton was quoted in a media article saying that Council could ask for money for alternative routes from the higher levels of government in 2017, before the study is complete. A majority of Council has the democratic ability under procedural rules to pass such a motion. There are positives and negatives with that approach. After reading the staff report, considering the situation, and hearing from residents, Kevin will be outlining pilot suggestion. Should my suggestion fail, Fight Gridlock will of course respect the expert consultants to provide more information on transit options in Brampton. We will read every word, attend every meeting, and offer suggestions along the way. 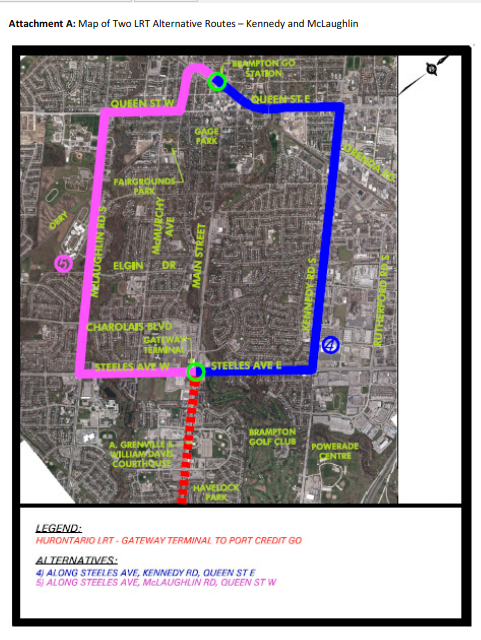 And now with the Hurontario LRT (HuLRT) Gateway redesign…. A stop hierarchy has been developed for the HuLRT service. It will closely follow the existing Züm stops from the Mississauga border to the Gateway Terminus. The redesigned Gateway terminus will be at grade — on street level, on the south side of Steeles Ave. No doubt, this is to accommodate options for expansion at a later time as you can see by the tracks going east or west. A grade-separated pedestrian connection (tunnel) is proposed to connect as many as 400 passengers every 5-10 minutes to start, eventually growing to 600, from the LRT terminus to the Gateway Terminal. A Public Open House will be held on February 28, 2017, in the City Hall Atrium to provide the public with an update on the Hurontario LRT project. Watch out for that. Fight Gridlock’s position is that a tunnel is probably the best approach to connecting the LRT terminus to the Gateway Terminal. A grade separated crossing ensures that pedestrian traffic is able to connect between transit points uninhibited. Street-level traffic also remains uninhibited. Further, at a junction like Steeles and Hurontario, which moves at a quick speed, it’s important to separate vulnerable road users to achieve Vision Zero. Overall, we are sad that Brampton finds itself in this situation compared to where we could have been. We could be talking about the next phases of the LRT, instead of divergent routes. We could be leveraging Queen’s Park and Ottawa to extend and expand, instead of the time it will take to debate the drawing board. We could be holding public meetings right now on phase two of the plan, as Cambridge, Ottawa, Toronto, Hamilton, and other cities are doing. Ironically, the first public consultation meeting for the Waterloo Region LRT Phase Two expansion happens on the same day Brampton will be discussing the HMLRT alternatives. We had hope in 2015 that 2017 would be different. Yet here we are. One thing hasn’t changed and that’s the fact that people still care, still want better transit, and a group like ours still exists (and enjoys the time we volunteer doing this advocacy!). Our group wants more transit options in Brampton. We want more service and more people to have the choice of leaving their car at home. The founding principles of this group are evidence-based planning, good transit design and best practices, and supporting networks. While we want new infrastructure in Brampton, we also believe in providing analysis, research, and speaking out about choices. We feel compelled to be a group that doesn’t blindly accept what is being offered. Rather, we will provide feedback. That doesn’t mean we’re against progress, shovels getting into the group, or action. Quite the opposite: We want to see more places in Brampton get better transit, not fewer. There are many other transportation projects in Brampton we support: Expanding the local bus service, complete streets (IE better walking/cycling conditions), GO Transit’s Regional Express Rail project including the construction of the Halton-Brampton Rail Freight bypass (subject of a future article), and the Queen Street Rapid Transit Master Plan Study. Our original position on transit planning in Brampton has not changed since our founding in 2014. We support an integrated, rapid, efficient, transit-rider oriented, regionally and locally connected, network of transit lines in Brampton. We don’t support alternatives; we support an “all of the above” approach. We continue to support the City of Brampton Transit and Transportation Master Plan (which is supported by the City’s Official Plan) and only wish to see the network grow, rather than duplicate, leading to inefficiencies. We want to see a bigger network, not a smaller network for more resources inefficiently executed. At the end of the day, this situation is all about transit riders, both regular and irregular, no matter where they are going in Brampton or at what time of day. We sincerely want better transit service right now, and decisions that lead to better transit service quickly. That’s the motivation behind this group’s advocacy efforts. What are your thoughts on these updates? Let us know in the comments. If you want to depute to City Council and tell them what you think, or write to them, please let us know.